Orion, a star picture of an angel of the Lord, confronts two huge beasts, one a land beast (Taurus) and the other from the sea(Cetus). Right between these two monsters is a small ram, who’s ancient name, Taleh, actually means ‘the lamb’. This picture almost says it all, doesn’t it? 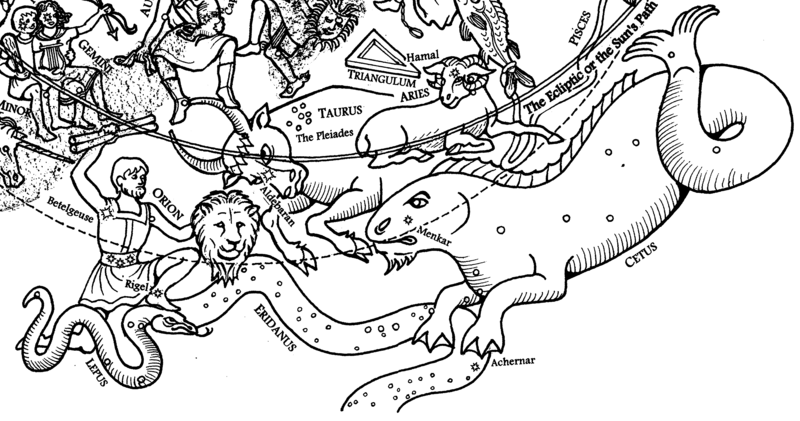 I wrote about Orion in my posts on Chapter 10, but here in Revelation 13 the focus is on the two beasts. Let’s explore the first beast: John describes the first of these as ‘coming out of the sea’. It has 7 heads, representing nations, rulers, institutions and the like, and 10 horns representing power and authority. Cetus, the beast from the sea, represents worldly power and authority and so the label I attach to him is ‘humanism’, the sum of science, medicine, philosophy, economics, technology, military power, politics, and hedonism. The physical description of this beast as being part leopard, part bear, and part lion comes from Daniel’s prophecy concerning three major world powers of the ancient world (Daniel 7:1-7) and John notes that their power and authority are given by the dragon, Satan. Revelation 13:3 contains a detail that has provided endless stretches of imagination for many commentators: ‘One of the heads of the beast seemed to have had a fatal wound, but the wound had been healed.’ Fanciful explanations have ranged from State presidents who have survived assassination attempts, like Regan, to Gorbachev who is unfortunate enough to have a red gash-like birthmark on his head. However, it is far more in keeping with the purpose and style of Revelation to understand this verse as a reference to the hydra-like nature of humanistic powers. For instance, the USSR fell apart as surely as the Berlin Wall, yet we are currently observing how Russia is once again becoming a power player on the world stage. Humanistic ideas, institutions, and forces don’t die out, they simply re-brand themselves. Unregenerate mankind worships the beast of Humanity and its master the devil (Revelation 13:4), and their blasphemous hymn of praise, “Who is like the beast?” is a parody of Exodus 15:11 and Psalm 89:8. Think for a minute on the sources of truth and authority drawn on by the majority of people – science, philosophy, the military? And their sources of power are economics, technology, and politics. Although they wouldn’t own to this, don’t these people, in reality, worship at the altar of humanism? The 42 months during which this beast exercises its demonic authority is the church age, from the first to the second coming of Christ as described in THIS post.Revelation 13:7 is set within this context and states the unpalatable idea that humanism has the power to conquer the church. Of course, when we consider this carefully, there is no real surprise here. The world seemed to conquer Jesus when the Romans crucified Him, but Jesus rose from the dead! Again, the world seemed to conquer the early church when Saul hunted down Christians wherever he could find them, but all the persecution did was to scatter Christians all over the known world and to spread the Gospel through them. John’s final comment on the beast from the sea’s assault on the church is; ‘This calls for patient endurance and faithfulness on the part of the saints’ (Revelation 13:10b). In my next post, I want to describe the other beast, show you the relationship between them, and perhaps include some information on the infamous number of the beast!